Where ever I was employed I always found myself creating whimsical portraits of coworkers or "caricatures" with the big head and little body doing something that fit that particular person. Often the art was drawn to commemorate a promotion or retirement. I am always getting requests for this service so If you are thinking of a caricature as a gift, you've come to the right place! I require a good picture of the subject (check out the examples below) and any idea you might want to incorporate into the picture. I will send you a pencil sketch to approve. Then your caricature is expertly created by me and delivered to your email box in digital format. 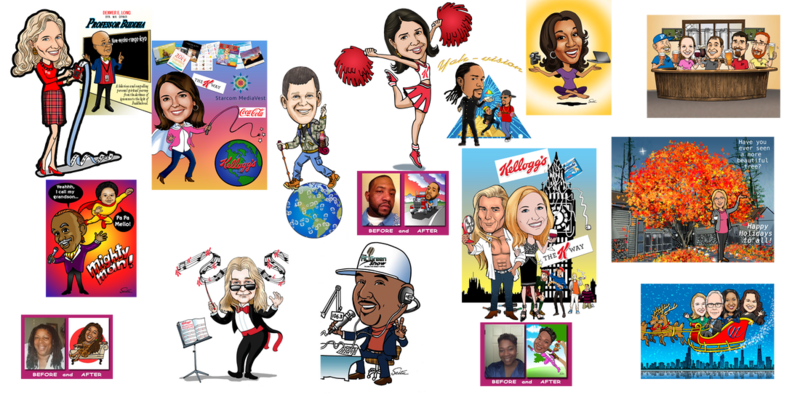 A digital caricature has several benefits including; faster delivery, plus a digital caricature is flexible in how you can use the art. It makes it ideal for use as a: birthday gift, corporate gift, retirement gift, avatar for IM programs or Skype, business card, personal web site, or printed on t-shirts mugs and other items! I'm just saying, you can get a lot out of it!